like I had stated before, hansichen is added for being the first who joined the GB and Zuology for his help here in the forum. To all of them, congratulations and please let me know which version you'd like to have added. Whoa, this is nuts! Thank you, PlastikSchnittstelle!! I will PM you later regarding my added choice. Congrats my dude or dudette! Omikron wrote: ↑ Are there any updates? Yes, backup plan is in full swing. the samples still haven't arrived. Everything else is prepared to build them, take pictures and make the reddit post. Then I assume it won't take long until I get enough new orders to make up for the still missing payments. Samples are on the way. Hope the arrive before the weekend but maybe it will only be monday. the samples (2x SKB60-WKL and 2x SKB75) arrived on friday. I spent the whole weekend modding switches and building the boards (including a ghetto mod, hint: bottom row of the 75% boards). Today I went out and found a nice spot where I took pictures. Sorry that the boards (especially to one with the tai hao caps) are quite dirty on the pictures. I hadn't noticed that before I went outside and at the spot I didn't had anything with me for cleaning. some time ago I was asked by one of you if I would consider offering a plate for a PCB that was then called the "Ergo60". Back then I declined because the project was already complex enough. Now that I have to make up for missing payments and after two more asked me about a plate for that PCB, I contacted shensmobile and I got his blessing to offer a SKB60-Boardwalk version as well. I won't support all the possible layout for the Boardwalk PCB since the plate wouldn't look nice. I'll offer not one but two different Boardwalk plates (the only way to avoid huge holes in the bottom row). If you already are a part of the SKB-GB and you want to switch to a SKB60-BW version or add one, please PM me. If you read this, want SKB60-BW but are not jet a participant in this GB, then please have a bit more patience. Once I post on reddit, I'll have new pictures ready and by then the google order form will have the SKB-BW versions included as well. If one or both of the plates get a minimum of ten orders, then they will happen. Lovely photos and lovely samples... I will try to help wherever I can when the thread is up. Excited to hear of more progress as we move along. Those samples definitely look good. Looking forward to getting my SKB75! I'll have the pictures, the reddit post and the updated google form ready hopefully still this day, if not tomorrow. hey I just posted the GB on reddit. I really hope this makes up for at least some of the missing ones. hope I can get your help there. Not sure if the GB is still actually open, but I finally caved and submitted an order (via the form linked in the reddit post). The main reason is of course that the final product looks like it will be something really special. But what tipped the scales for me was all the hard work and care PlastikSchnittstelle has poured into this project. That has to be rewarded! Now, I ordered the 65% version -- is there a list of suitable 65% pcb's anywhere? I just paid my invoice, but noticed too late that it said SKB75, not SKB65. Not sure if I made a mistake when filling in the form or what happened (it's a bit hard to figure out since you don't get receipts for Google forms). Anyways, I've sent an email regarding the issue. I assume this is the correct address? Last edited by Compgeke on 18 Oct 2018, 02:11, edited 1 time in total. yep, you did fill out for a 75 - good we handled that already. Last week I've been going through the google spreadsheet which is the output from the google form. After filling out the form, many of you wanted to change stuff. I had to check all communication (PMs from Gh, Dt and Reddit as well as emails) and make sure everything is correct in the spreadsheet. I put together a script that was supposed to help me. Paypal can output a file for me with all emails of the paid SKB-invoices and the script just compared that against the emails in the form entries. Strangely the amount of unpaid invoices was still quite high according to the output of the script. When I went through the list of unpaid ones I quickly noticed some names that I know for sure had paid. What was wrong? Well some of you paid the invoice with a Paypal account that had a different email address than the one you put into the order form. That's why the script didn't find a match. So in the end I found myself going through the whole sheet manually. Man I can tell you this together with bringing the order sheet in line with all the changes discussed via PMs took me quite some time. Had to check again so many times cause whenever I did, I found another mistake. Now the spreadsheet is error free (99% sure)! When I started sending out invoices, 149 had entered the order form and as you know a lot (over 40) hadn't paid after the first month. Now after another month has passed and thanks to the reddit post, 144 have paid their invoice and this means I now have to decide on how many extras I will add and then I can ask for a quote for final production, then pay and by doing so kicking of the production. The order form will remain open so getting an SKB is still possible. Who fills out the form will get an invoice quickly. If I'm out of extras of a particular version, I'll just take it out of the form. I didn't had time to bring the Reddit GB post over to mechmarket jet, like some of you told me I should do so. I'll do that today (99% sure). Shensmobile will probably start his boardwalk GB today. Some of you had convinced me to add support for it as well. 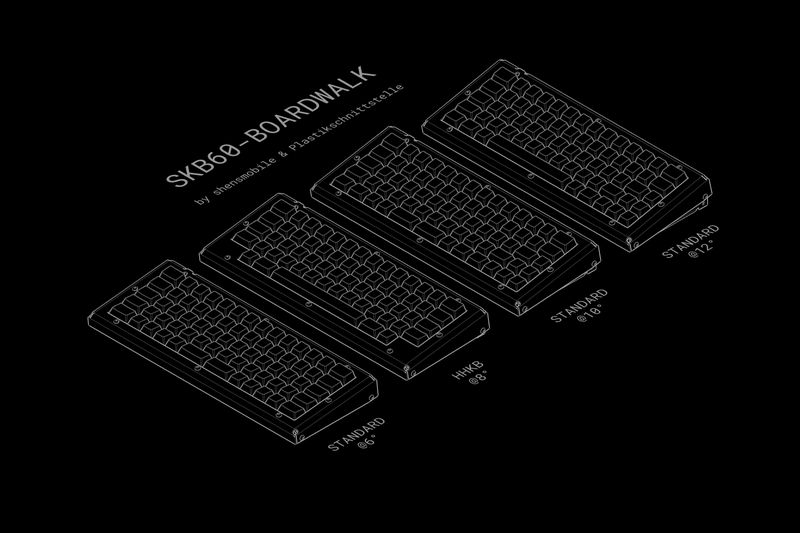 I made some more graphics to illustrations what layouts the two different SKB-Boardwalk plates enable. I had promised to give away two more SKBs for the ones who would help out the most over at reddit. Of all who did I can't really tell who helped "more" so I'd like to make a mini raffle to decide. But before that I hope some of you will help out when I bring the reddit post over to mechmarket. Same for the Boardwalk version, I'll post separately for that as well. Keep in mind that you can't post double right away (48 hr limit). I might suggest putting the Boardwalk info within the same post. LightningXI wrote: ↑ Keep in mind that you can't post double right away (48 hr limit). I might suggest putting the Boardwalk info within the same post. Thanks, wasn't aware of that. PlastikSchnittstelle wrote: ↑ Now the spreadsheet is error free (99% sure)! Will you post a list of all orders before the end, so everyone can check that their order is registered correctly? FSund wrote: ↑ Will you post a list of all orders before the end, so everyone can check that their order is registered correctly? absolutely, just like I did already a few times. will do so tomorrow, so everybody can check for himself. oh and yesterday I was out again to take some more pictures. I hadn't shown any pics without caps. I took some off, now you can also see the plate. Wow this looks better than expected. This full black design has its charme! I had the same lighting conditions yesterday like the first time I took pictures there. but in hindsight, I think the low, unclouded autumn sun makes the shadows quite harsh. maybe slightly cloudy would have been a bit better. anyway, this time I also cleaned them properly before. in the first shoot out there some of the cases were quite dirty. I updated the order list. Everyone should please check if his order is correct. Even if you had checked already in one of the earlier lists, please check again. The ones who won an extra SKB have theirs already added in the list. I have given up on those who got their invoice long time ago but still haven't paid. This is luckily not a problem anymore, since the posting on reddit has indeed made up for them. There are a few who signed up after the reddit announcement but haven't paid jet. That's ok, since they just joined recently. They are accounted for in the order quantity. I decided to put only those into this list who have paid their invoice. I think this is a more sensitive way, than exposing the others. List will be updated when more have paid. Again as searchable PDF, attached to this post. I can't wait anymore, it is killing me, I NEED THIS!!!!!! In other words: Do you have an update for me?